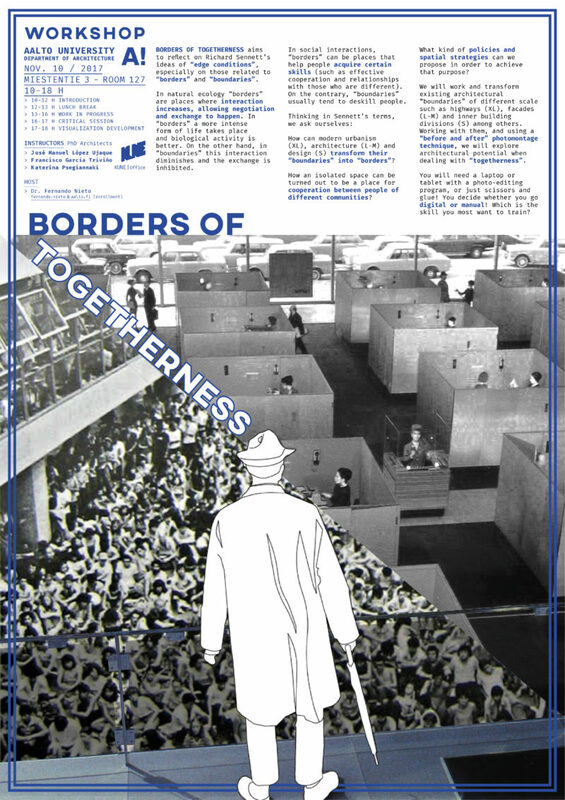 BORDERS OF TOGETHERNESS aims to reflect on Richard Sennett’s ideas of “edge conditions”, especially on those related to “borders” and “boundaries”. In natural ecology “borders” are places where interaction increases, allowing negotiation and exchange to happen. In “borders” a more intense form of life takes place and biological activity is better. On the other hand, in “boundaries” this interaction diminishes and the exchange is inhibited. In social interactions, “borders” can be places that help people acquire certain skills (such as effective cooperation and relationships with those who are different). On the contrary, “boundaries” usually tend to deskill people. Thinking in Sennett’s terms, we ask ourselves: How can modern urbanism (XL), architecture (L-M) and design (S) transform their “boundaries” into “borders”? How an isolated space can be turned out to be a place for cooperation between people of different communities? What kind of policies and spatial strategies can we propose in order to achieve that purpose? We will work and transform existing architectural “boundaries” of different scale such as highways (XL), facades (L-M) and inner building divisions (S) among others. Working with them, and using a “before and after” photomontage technique, we will explore architectural potential when dealing with “togetherness”. You will need a laptop or tablet with a photo-editing program, or just scissors and glue! You decide whether you go digital or manual! Which is the skill you most want to train?